Son Of The Sea is a song written by Ken Theriot and Lisa Theriot. The song is on Ken Theriot’s album, “Human History.” It is the story of Manannán mac Lir, son of the Sea God, Lir, in Irish Mythology. As a deity, you often get some cool toys and powers, which this song harmoniously tells you all about. 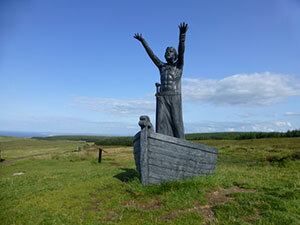 And yes, Manannan is the the guy in the statue stolen (and later found) in Ireland earlier this year:-P.
Human History is available on iTunes, CD Baby (where you can still get actual physical CDs), and just about every other online music source.